Cellufine™ MAX AminoButyl is developed mainly for concentration of molecules having strong hydrophobicity such as VLPs (virus like particles). Cellufine MAX AminoButyl is designed on the basis of optimized Cellufine MAX Butyl to improve recovery of target molecules. Ligand structure of Cellufine MAX AminoButyl is described in Figure 1. Specification and characteristics of Cellufine MAX AminoButyl is described in Table 1 and 2. As base matrix is highly cross-linked cellulose particles, Cellufine MAX AminoButyl show superior flow property like figure 2. Partial purified r-HBsAg VLPs solution was loaded on packed Cellufine MAX AminoButyl column (16 mm I.D. x 500 mm H) and then column was washed by 20 mM phosphate buffer (pH 7.0) sufficiently. At first, phosphate buffer (pH 7.0) containing 0.1 % Triton X was used as elution solution (Elution 1). And then molecules was eluted by 2 M NaCl (Elution 2). Each fraction was recovered and analyzed. The figure below showed a chromatogram of purification of r-HBsAg VLPs with Cellufine AminoButyl. r-HBsAg VLPs was detected by ELISA assay. Table below showed the results in this test. Most r-HBsAg was obtained in elution 1. Results of protein assay in fraction suggested further purified r-HBsAg was concentrated by detergent elution. The results suggested Cellufine MAX AminoButyl is useful to purify VLPs. polyamine surface modification that has been partially modified with butyl groups. This ligand design concept will allow for flexibility in applying, Cellufine MAX IB to a wide range of fields in bio-pharmaceutical purification. Ligand structure of Cellufine MAX IB is described in Figure 1. Cellufine MAX IB can be used as negative (flow-through) mode for Mab polishing applications. Cellufine MAX IB was packed into a 5 mmID x 13.5 cmL (2.65 mL) column and equilibrated in 20 mM Tris-HCL buffer at pH 7.0 at a flow rate of 1.325 mL/min (407 cm/h).After initial capture by a rProtein A column, the resulting elution fraction in 60 mM Acetic Acid pH 3.5 was then held for 60 min at pH 3.4 for viral inactivation. 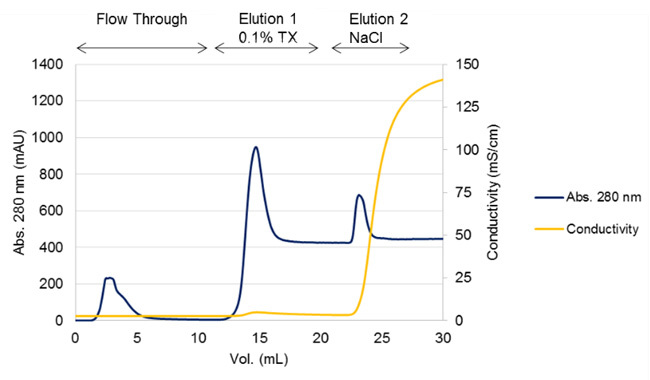 After this step the sample (at 18.0 mg/mL Mab) was adjusted to pH 7.0 with Tris base and a conductivity of 6 mS/cm with NaCl or dilution with column loading buffer. 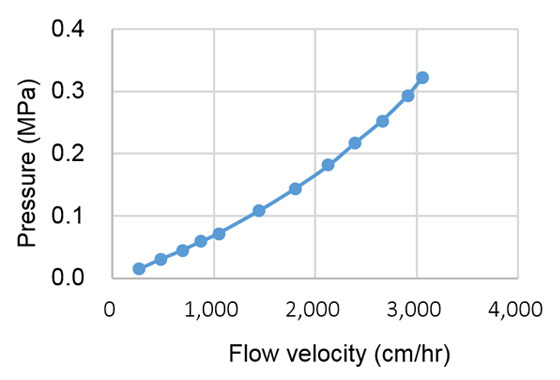 After 0.22 µM filtration, the clarified sample was pumped onto the MAX IB column at 150 mg Mab / mL of resin and the flow-through + wash fraction in equilibration buffer were collected. A summary of the removal of CHO-HCP, dsDNA (HCD), leached rProtein A and aggregated material is shown in Table１, below for Cellufine MAX IB, MAX Q-h and a polymer modified agarose Q competitive media in a flow-through polishing format. This research is partially supported by the developing key technology for discovering and manufacturing pharmaceuticals used for next-generation treatments and diagnoses both from the Ministry of Economy, Trade and Industry, Japan (METI) and from Japan Agency for Medical Research and Development (AMED). Cellulose is well-known as a natural product having chemical and physical stability. Thus, since Cellufine is derived from cellulose, it also is stable to chemicals and caustic and acidic solutions. CIP of all Cellufine media can be carried out with 0.5 M NaOH solution. Used media should be stored in 20 % ethanol at 2-25 ℃ after cleaning. Copyright © 2011 JNC CORPORATION All rights reserved.